Hey folks! I know it's been a bit since the last monster post and I just wanted to update you on some news. First and foremost, some blog news. Next week is a FULL week of BRAND NEW NYARLATHOTEP COLLABORATIONS! Authors Nathan Ballingrud, Kaaron Warren and Simon Strantzas created their own versions of the Crawling Chaos for me to illustrate. Not only that, but there will be two brand new avatars created by Jason McKittrick and myself!! Secondovly, Seventh Church Ministries now has it's own site! It's still a bit under construction but the framework is there. 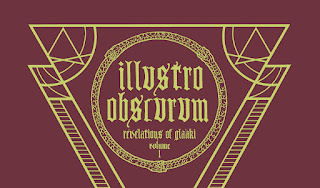 You can look at past issues of Illustro Obscurum and other artists books. Not only that but you super collectors can see pertinent printing info like, dates, editions and numbers. I also have some super amazing news that I can't get into too much, but I'll be illustrating a story for Scott Nicolay! Sam at Dim Shores is putting out a chapbook of Scott's super ominous tale after. I'll be doing the cover and three interior illustrations! Scott is one of my favorite contemporary writers, so this is an honor and a blast. I'll post the actual illustrations once I have clearance. 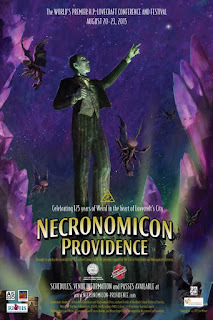 Most importantly, I'll be tabling at NecronomiCon in Providence RI this August 20th-23rd. Not only that but I'll be in the Ars Necronomica show at the Providence Art Club with this piece based on The Thing On the Doorstep! The Ars Necronomica show is full of amazing artists who I'm humbled to be counted among. Skinner, Allison Sommers, Jeanne D'Angelo, Jason McKittrick, Dave Felton, Seldon Hunt, Bob Eggleton, Allen Koszowski and Jason C. Eckhardt among a ton of very talented others. And for you super nerds, I'll have a NECRONOMICON ONLY Illustro Obscurum available at my table!! 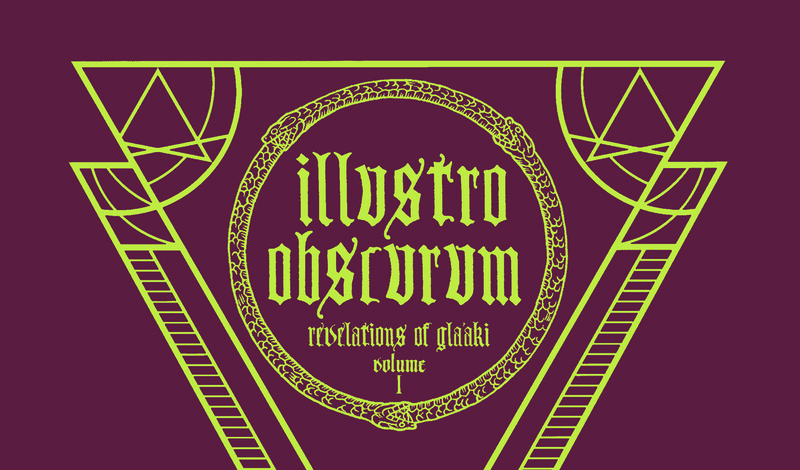 The guest of honor this year is Ramsey Campbell I'll be making an exclusive Illustro Obscurum Revelations Of Gla'aki I zine limited to 20 copies!!!! I will also be on two panels at the 'Con. One will be titled ANTARCTICA! about At the Mountains Of Madness and it's Antarctic setting. The other is OH, THE TENTACLES! at Omni 2 about Lovecraftian art. I'm most excited about that panel considering I'll be sharing the stage with John Coulthart, Lauren Panepinto, Allen Koszowski and Jason C. Eckhardt! Finally, Jeanne D'Angelo, Alan Brown and I will be tabling at the Small Press Expo in Maryland this September. If you're in the area hit me up and buy some zines! "Devilish laughter broke out all around him. Hideous monsters galloped in herds before him." "This is the name of a curious humanoid monster in the folklore of the Volga region of Russia. 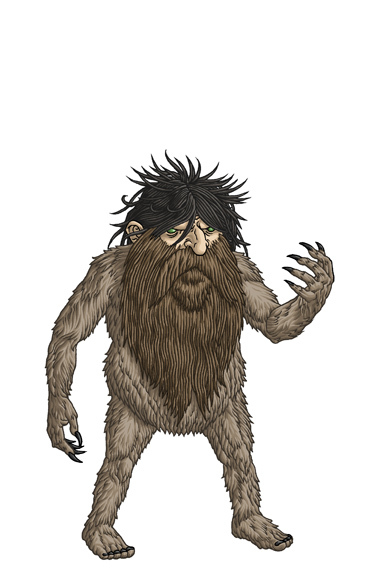 The Palesmurt is described as looking like a human but having only one half of the body, one arm and hand, one leg and foot and a head with only one eye. This horrific being trapped unwary travelers in his territory and choked them to death." "He had not the courage to look at them; he only saw one uncouth monster standing by the wall, with long, shaggy hair and two flaming eyes." "A few sources note that the spirit had tiny horns and a tail or horse ears;"
"Commonly, it was said that he resembled a dwarf-like old man, with tangled locks and a shaggy beard that hid his face, apart from a pair of bright eyes, and soft fur that covered his body, including the palms of his hands and soles of his feet. Hirsuteness was a characteristic feature of demonic beings in general and may be connected with the pictorial representation of devils in icons." tusk peeped out of his mouth, a hump appeared behind his head, and the Cossack turned into an old man. " "As a priest intoned 'Christ has arisen' for the first time during the procession around the church, the wizards would be revealed to the holder of the egg with their backs to the altar (and complete with devilish horns)." "All these monsters stared about seeking him, but they could not find him, since he was protected by his sacred circle." "In appearance, the vodyanoi resembled a repulsive old man with hirsute body and long, matter hair and beard. It was frequently suggested that, like the devils in Russian icons, he looked black or that is body-hair was black. Some physical details, on the other hand, suggested the influence of the watery milieu in which he lived. Thus, his hair might be green or he might have webbed feet, a fishy tail, scaly skin. " "This is the name of a dangerous water being in the folklore and traditions of Russia. 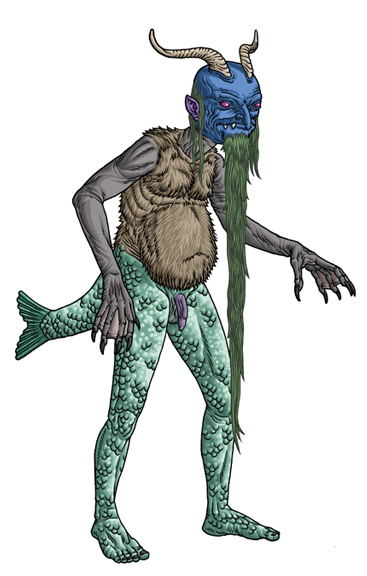 The Vodianoi, also called Vodyanoi, Vodyanoy or Vodnik, is variously described as an old man with a blue face, white beard and green hair; an old man covered in scales or fur with huge paws, glowing eyes, horns and a tail; or entirely as a grotesque fish." "The females are described as being beautiful women above the waist and having the tail of a fish in the manner of a mermaid, but the nix usually inhabits freshwater." 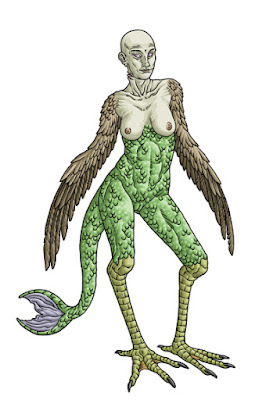 "However, in the Slavic mythology of eastern Europe, the female beings are described as resembling the Siren of classical mythology, with the torso and head of a woman but the legs and wings of a birds." 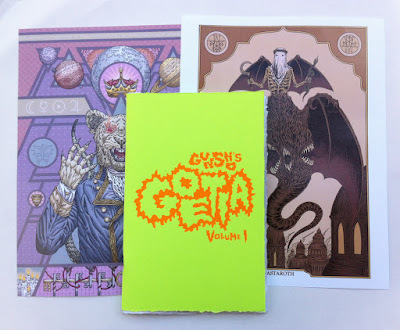 GUNSHO'S GOETIA VOL. 1 IS SOLD OUT!! Thanks to everyone who purchased a copy or tried to. I'll have the first batch in the post by Monday or Tuesday depending on 4th of July holiday restrictions.